This user guide covers using CKAN’s web interface to organize, publish and find data. CKAN also has a powerful API (machine interface), which makes it easy to develop extensions and links with other information systems. Some web UI features relating to site administration are available only to users with sysadmin status. 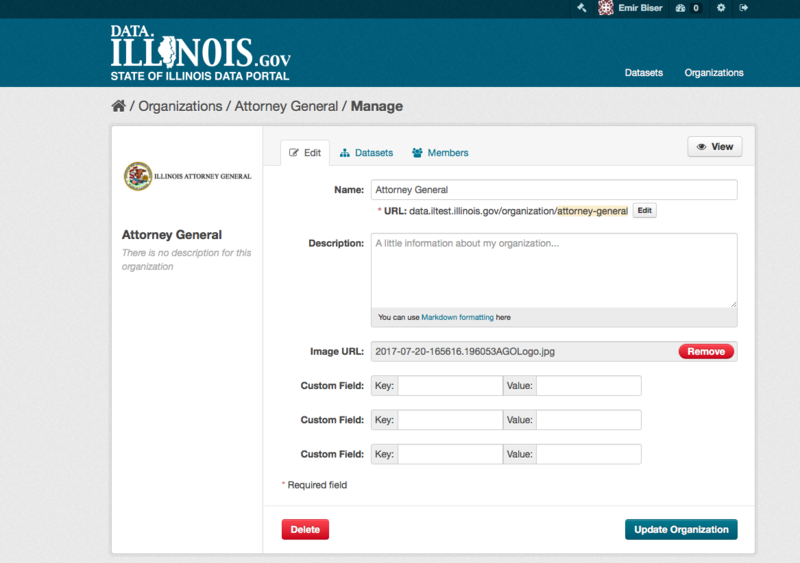 Username – This should be either illinois.gov or public.external.illinois.gov account. For example, “illinois\testuser” or “central\testuser (if you are part of trusted domain)”. If there are problems with any of the fields, service will tell you the problem and enable you to correct it. When the fields are filled in correctly, CKAN will create your user account and/or automatically log you in. If you do not have an account please select to create a new one and follow the prompts. You will need to be a member of an organization in order to add and edit datsets. 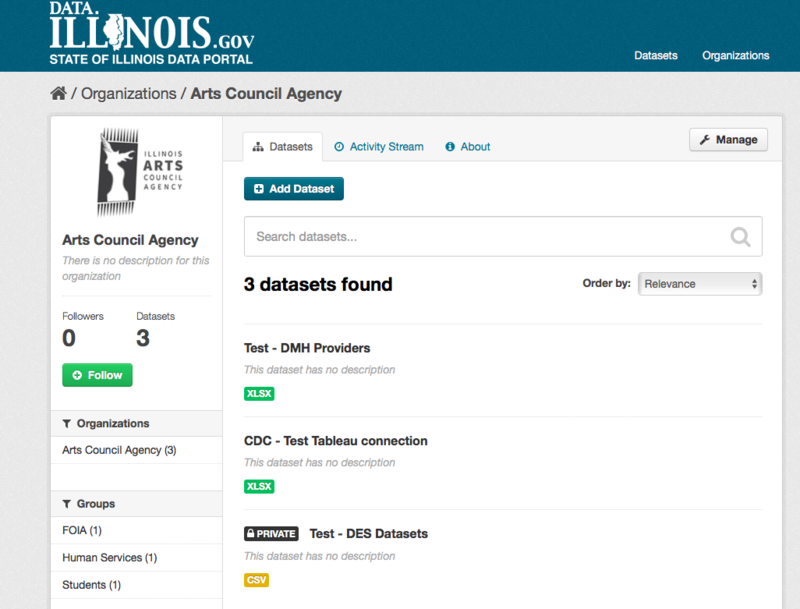 On http://demo.ckan.org, you can add a dataset without being in an organization, but dataset features relating to authorization and organizations will not be available. Visibility- visibility options are Private or Public. Private means you have to have account within an organization that host the dataset to interact with the data. Datasets marked as private will not appear in general search by user that is not logged in. Author/Maintainer – This section is really important as it helps users of the dataset identify correct points of contact if further questions around data quality, understanding or availability are made. By default, the only required field on this page is the title. However, it is good practice to include, at the minimum, a short description, tags, the license information and maintainer. You should ensure that you choose the correct organization for the dataset, since at present, this cannot be changed later. You can edit or add to the other fields later. You should be able to find your dataset by typing the title, or some relevant words from the description, into the search box on any page in your CKAN instance. CKAN displays the “Edit dataset” screen. You can edit any of the fields (Title, Description, Dataset, etc), change the visibility (Private/Public), and add or delete tags or custom fields. 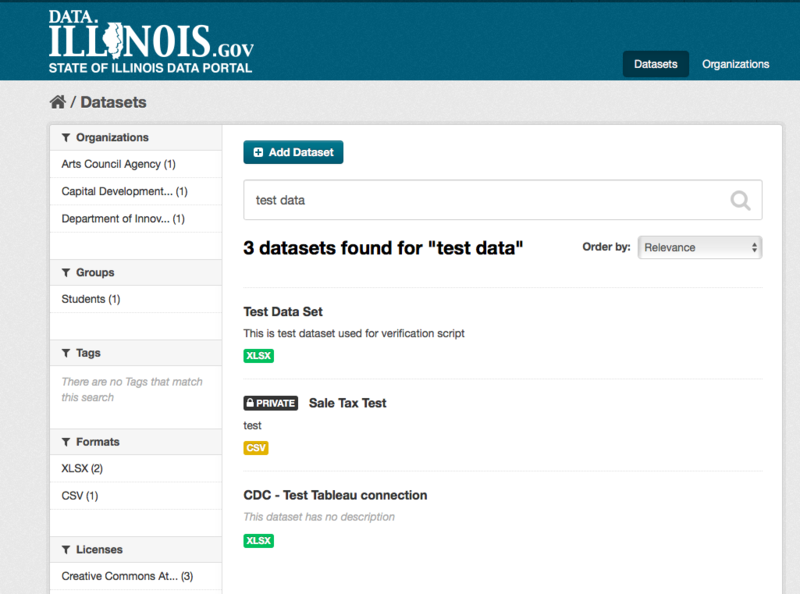 If the organization is of interest, you can opt to be notified of changes to it (such as new datasets and modifications to datasets) by using the “Follow” button on the organization page. You must have a user account and be logged in to use this feature. If the dataset is of interest, you can opt to be notified of changes to it by using the “Follow” button on the dataset page. You must have a user account and be logged in to use this feature.